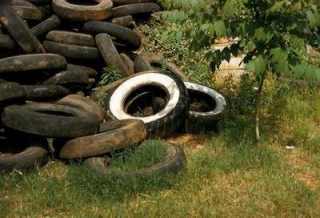 Be cautious about stagnant water lying in old tires, tin cans, bird baths, and similar sources. With all the media attention, most people are aware that the West Nile Virus has made it to Canada, but many do not know the specifics of the virus. What is it? what are the risks? What can be done? The virus was named after the West Nile Region of Uganda in Africa, where the virus first appeared in 1937. In 1999, it appeared in the United States for the first time, and in the summer of 2001 was discovered in birds in southwestern Ontario. The West Nile Virus is a mosquito-borne virus; only seven of 57 species of mosquitoes found are potential carriers of the virus. Those mosquitoes that do carry the virus typically feed upon birds; however, when food resources are limited they will bite humans. Many people can be infected with the disease and show no symptoms at all. To these people, the virus is harmless. In a small number of cases flu-like symptoms, such as fever, frontal headache, muscle aches and, occasionally, swollen lymph nodes and skin rash may occur. Reaction to the virus usually occurs within 3 to 15 days of being bitten by an infected mosquito. In rare cases, serious illness such as encephalitis (inflammation of the brain) or meningitis (inflammation of the lining of the brain and spinal cord) may occur. It is extremely rare for the disease to be fatal. Healthy individuals are at lesser risk than those persons over 50 years of age. Persons with immune deficiency have a much higher risk of severe illness. When exposed to the virus, humans develop antibodies to the virus, providing them with life-long immunity (British Medical Journal, September 2000). In areas where mosquitoes carry the virus, very few mosquitoes (less than 1per cent) are likely to be infected. The chances of being bitten by an infected mosquito are very small. It is still important as a safety precaution to avoid exposure to mosquitoes in areas that the West Nile Virus activity has been documented. Do not let water stand outside for more than 4 days. Because of misinformation, many people are considering filling in the wetland on their property. Please don’t. Not only are the infected mosquitoes very unlikely to breed in wetlands (marshes, bogs, fens and swamps), but wetlands are a very important filtration system for drinking water. The water you use to brush your teeth, make your coffee or shower in the morning most likely spent part of its life slowly filtering through a wetland. A healthy wetland is a balanced ecosystem containing predatory fish, birds, frogs and insects that help to control mosquito populations. Wetlands trap, breakdown, remove or use nutrients, agricultural herbicides and pesticides, organic waste and sediment that flow into them with surface water runoff. Wetlands provide habitat for hundreds of species of plants, birds, fish, and other wildlife. They reduce the severity of floods by retaining water and releasing it slowly during drier periods. They help to reduce shoreline erosion by slowing the flow of water and lowering the peak runoffs of streams and rivers during heavy spring flows and storms. Wetlands recharge groundwater by soaking up surface water and allowing it to seep back into the ground. Wetlands also provide unique areas for recreation and for scientific research. The West Nile Virus will have the greatest impact on bird populations. Although there is a threat to humans, it is important to understand that the virus will probably continue to exist in the environment despite controls that may be implemented. It is possible to reduce the mosquito populations through certain measures, but it is expected that the West Nile Virus will never be eradicated. Similar to Lyme disease in Southern Ontario, awareness, education and precautionary measures can limit the impact the virus has.